I have way more rings than I do fingers. My obsession with rings is to be blamed by the character Phoebe on the TV show Friends, which I am also still obsessed with. Since my eight-year-old self discovered this show, I saw Phoebe as the girl I wanted to be when I grew up. 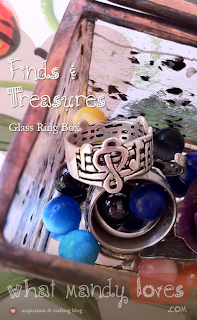 All the jewelry, all the quirky, all the AWESOME! I tried putting on as many cheesy rings as I could get from those grocery store vending machines, but since I'm sadly allergic to most metals and fake metals I couldn't keep them on for too long. They itched so much I just ended up tossing them and wishing I could get better rings that I wasn't allergic to. My hands remained naked for years. MUST BUY ALL THE RINGS! 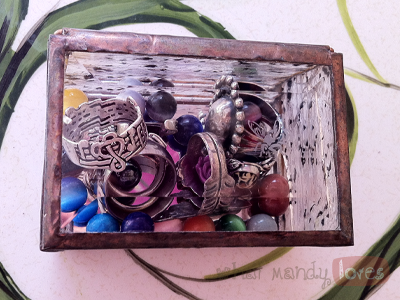 With all these extra rings hanging out, my collection spread into little trays and drawers. I had one of those hand statues to put a few on but there were too many to put on one hand. There's also a little ceramic bowl my sister made for me that holds some but like the hand couldn't fit them all. Along came one craft festival find that solved my problem. 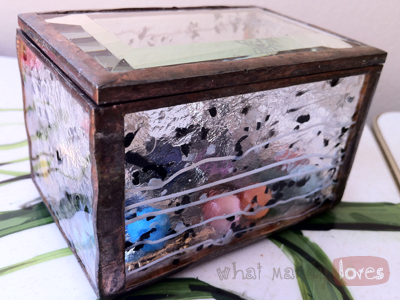 This glass ring box with black and white speckles, a bee etched on the lid, and copper edging is adorable and fits all my rings! The glass lets me see all the rings inside so they're displayed nicely (and anything that's visible is always better / used more in my eyes). Some of my necklace charms have found a home in here, too. Those little colored balls are part of one necklace with a cage to place a ball in depending on what color you want that day. Don't they look fancy in this glass box! The box itself also looks great atop my button jewelry display. How do you show off your ring collection? How many rings do you wear on a daily basis, or why do you not wear any (excluding wedding rings)? Let me know in the comments.